Studio/Run Time: The Weinstein Company, 140 mins. Crossing Over, the new film from writer-director Wayne Kramer, highlights what was good and what was bad about Paul Haggis’ 2006 Oscar winner Crash. Haggis told us that Los Angeles is a haven for racists, and Stacy Peralta told us, in Crips and Bloods, that it’s essentially a gang town, and Kramer gives us a third version: Los Angeles is the land of illegal immigrants. You’d think that since these views overlap a fair bit, they might all acknowledge worlds beyond their own myopic perspectives, but Kramer’s sweeping aerial shots imply that he’s giving us a total picture, just like Peralta’s carved up maps and Haggis’ recurring ironies wove dubious Californian quilts of their own. 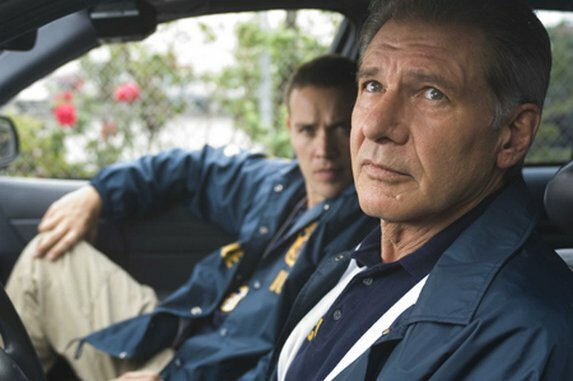 Harrison Ford, Ashley Judd and Ray Liotta are just three of the many people in Crossing Over whose lives revolve around the fates of struggling immigrants. Kramer has cherry-picked someone from every continent, except Antarctica, and tasked each one with representing a shallow version of the twisty path toward naturalization. In Crash, Haggis seemed willing to sacrifice insight for entertainment, jacking up each scene until it spun ironically off its axis or screeched at the top of its lungs. And then, having smashed Humpty Dumpty with a baseball bat, he tried to put it all together again with tearful turnarounds and magical snow. But through it all, he entertained, if only through sheer surprise. Without that same flair for showmanship, Kramer’s Crossing Over feels somewhat more sincere but also a fair bit less compelling. It’s no more insightful about immigration than Crashperfectly malevolent impulses. Harrison Ford bleeds for each illegal he comes across (which gets in the way of his job as a veteran enforcement officer) and childless Ashley Judd wears a big golden Africa quite literally around her neck. Might the story put a beautiful African girl in her life and send the child’s real mother conveniently off-screen? I’m not tellin’. The film plods along with frequently swelling strings until late in the game when it suddenly turns into a Judaic comedy, then a Peckinpah shootout, and then a Murder She Wrote mystery, the latter resolved with three nested flashbacks by a filmmaker with a markedly unimaginative sense of cinematic storytelling. With these bursts of drama Kramer is likely trying to draw lessons from similar films, but he doesn’t display the chops required for something pulpy like Crash nor the depth of thought required for something prismatic and awe-inspiring like The Wire. Crossing Over isn’t a terrible film, but it’s a terribly inconsequential one, a film that asks us to care about characters we barely know and weep over situations that Kramer, by all appearances, barely understands.